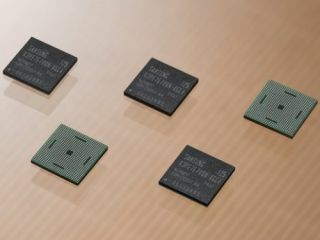 South Korean electrical giant Samsung has announced new image sensor chips and processors for the mobile market. The image sensor, known as the S5K2P1, packs a whopping 16 megapixels and backside illumination for sensitivity and low-noise performances. Although designed primarily for smartphones, Samsung believes the S5K2P1 will also find its way into digital still cameras and camcorders. This is due to its incredible video capabilities: Samsung reckons it's capable of 60 frames per second 16:9 video at up to 8.3 megapixel resolution - although you'd probably have to strap a small hard drive to your cameraphone to handle the sheer size of the video files. The sensor is currently being sampled by "select customers", with mass production scheduled for November. In addition to the epic image sensor, Samsung has unveiled the Exynos 4212 dual core ARM A9 processor. Based on a 32nm HKMG logic process technology with dual cores, it's said to offer a 30 per cent lower power level and 25 per cent increase in processing power. It also packs 50 per cent higher 3D graphics performance, video recording and playback at full-HD 1080p resolution and an on-chip HDMI 1.4 interface. Again, the new processor will be sampled by "select customers" in the latter quarter of this year, and Samsung has unveiled an official site for the chips. It seems Samsung is sticking two fingers firmly up to Apple following the iPhone manufacturer's decision to switch to Taiwan Semiconductor Manufacturing Co for the production of upcoming mobile chips.